Of the 600 Starbucks to close, five will be in Hawaii. 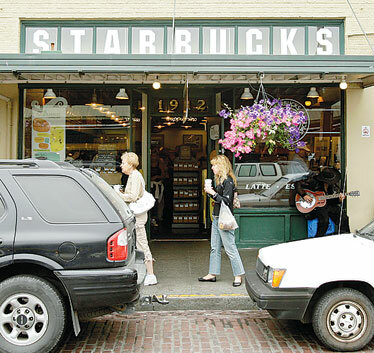 Pedestrians walked yesterday past the original Starbucks Corp. store at Seattle's Pike Place Market. Starbucks Corp. has targeted five Hawaii stores as part of the 600 total stores it plans to close in the U.S. beginning this month and continuing through March 2009. The five stores include three on Oahu, one on Maui and one on the Big Island. Two of them are at Ward Centers, which has four Starbucks within the neighborhood. The Seattle coffee retailer this month announced it was closing underperforming stores and trying various promotions to boost sales during economically stagnant times. Yesterday, Starbucks released the full list of 600 stores targeted for closure at www.starbucks.com. In Hawaii, Starbucks had a total of 71 company-owned stores, which will be reduced now to 66, and 14 licensed stores. Starbucks Hawaii spokeswoman Jill Wheatman said she was confident employees at all five stores -- referred to as partners by the company -- can be absorbed in other Starbucks stores here. Among the 600 U.S. stores that Starbucks Corp. is closing are five in Hawaii, according to the full list released by the Seattle coffee retailer yesterday. The five stores include Starbucks inside of Borders Books at Ward Centre at 1200 Ala Moana Blvd., at the Hokua at 1288 Ala Moana Blvd., Malolo Business Center at Sand Island, and within Borders Books at Waiakea Center in Hilo and Maui Marketplace in Kahului. Jill Wheatman, spokeswoman for Starbucks in Hawaii, said those locations were identified as ones where resources could be better reallocated. No precise closing date has yet been announced for these five locations, she said. Starbucks said the closures would begin this month and continue through March 2009. "There should be minimal impact on job losses at this time," Wheatman told the Star-Bulletin. "We feel very confident the partners in all the stores will be able to find positions within the rest of our stores." Starbucks currently has 71 company-owned stores in Hawaii, which would go down to 66 with the five closures, and 14 licensed stores. On July 1, Starbucks announced it would curtail its expansion plans, and close 600 company-operated stores in the next year, due to the slowing economy. Originally, the corporation had targeted 100 stores for closure in its U.S. portfolio. Most of the stores set to close were either unprofitable or too close to another existing location. Such is the case with the two stores at Ward -- which competed with two other existing Starbucks at Ward Gateway Center and next to Ward Theatre, just one block away. "We'll miss it," said Duane Komine, general manager of the Hokua, the upscale residential condo that has Starbucks on its ground floor. "That's our daily breakfast." The five closures in Hawaii are a small number compared to other states. In all, Starbucks store closures are spread across 44 states and Washington, D.C., including 88 in California, 59 in Florida, 57 in Texas, and 27 in Minnesota. Last week, Starbucks also launched several promotions in stores across the U.S. in the hopes it would help boost traffic. The promotions, which varied by region, included free 12-ounce iced coffees on Wednesdays for New York City customers with a coffee card, or a $2 deal for a second beverage after 2 p.m. in select cities. Those promotions were not launched in Hawaii, according to Wheatman, although customers who have joined the Starbucks Card Rewards program are eligible for discounts. "We're always looking at ways to add value for our customers in Hawaii," said Wheatman. Starbucks also announced earlier a deal with AT&T in which it would offer two hours of free Wi-Fi access. That Wi-Fi program has not yet been launched in Hawaii, according to Wheatman, but is expected to be up and running by October. In its fiscal second quarter, Starbucks' U.S. profit sank 28 percent. The cutting back of Starbucks stores in Hawaii has not dissuaded others from entering the market here. Emeryville, Calif.-based Peet's Coffee & Tea recently opened its first Hawaii store at the Sheraton Waikiki and is looking for more locations. The full list of U.S. store closures is available at www.starbucks.com.